Although it was, of course, founded some thousand years before the invention of Instagram, Salamanca looks as though it was made for the platform. 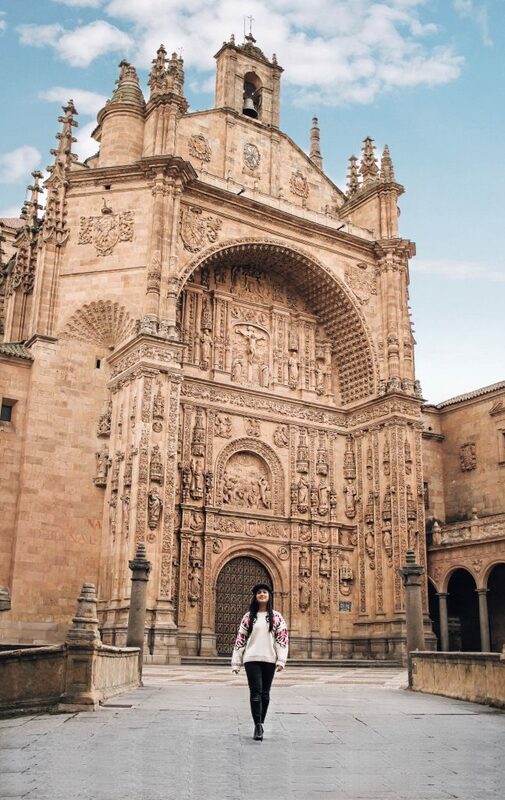 All of the exquisite architectural details, the bright light and the pastel backdrop make Salamanca just the ideal setting for gorgeous Instagram snaps. Salamanca is also easy to reach if you’re visiting Spain’s buzzing capital of Madrid. Just 200 kilometres away, it is a short and beautiful train or car ride to land in the stunning ancient university city with its Instagram hotspots. 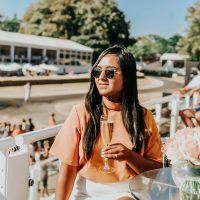 So, if you’re looking to document your adventures on everyone’s favourite photo sharing app, here are my top places to go and get the perfect Instagram snaps in Salamanca. One of the most recognisable landmarks of the Salamanca skyline is also one of the most gorgeous Instagram photo locations. The Ieronimus Tower stands more than 100 metres above ground level, offering a beautiful and unique perspective over Salamanca. From here, you can look out over the entire city, getting a birds-eye view over the charismatic and historic buildings. This view translates beautifully into Instagram photos. 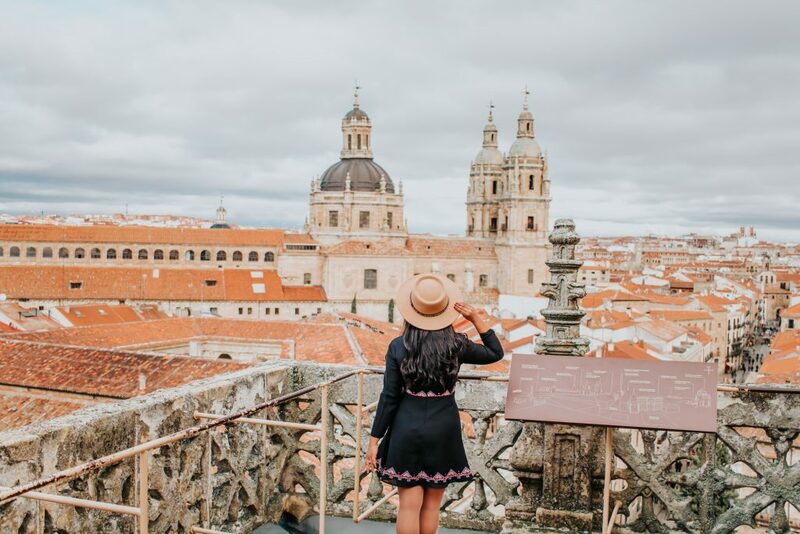 From the viewpoint, you can capture an image that really takes in the expansive beauty of Salamanca. I do recommend that you try to go as early as possible, as it does tend to get quite crowded by mid-morning, which impacts on what kind of photo you can take! To get it at its unspoiled best, aim to arrive around 10am. 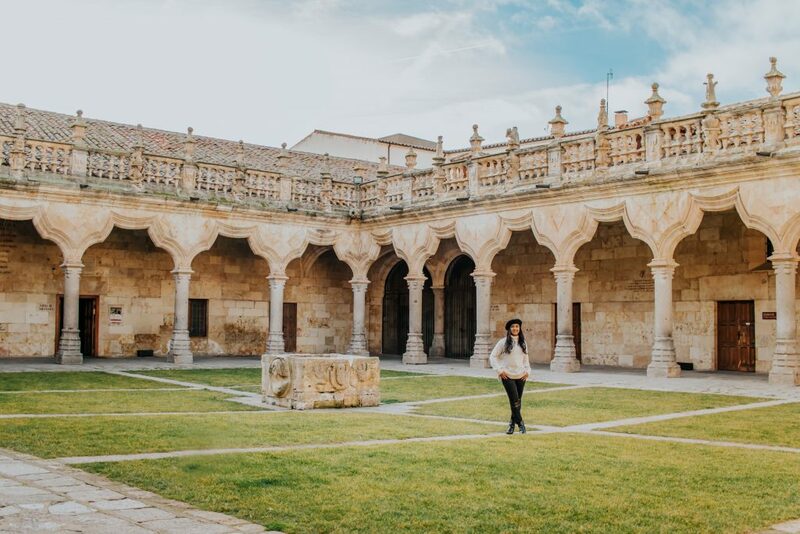 Salamanca is home to one of the oldest universities in the world, and the university is not only fascinating to explore, but a stunning backdrop for photographs. In particular, the elegant and uniform arches of Patio de Escuelas create gorgeous backdrops and unique shadowed frames which look beautiful and artistic when captured. To reach El Patio de Escuelas, simply turn left at the end of the university square. It’s often overlooked by tourists, so don’t be surprised if you find yourself alone in the beautiful square; ideal for taking in the architecture as well as capturing the ideal Instagram shot of the stunning archways. One of my favourite features of Salamanca is the many beautiful doors, which are often a deep red colour and dotted with iron insets, giving them a dramatic and medieval look. 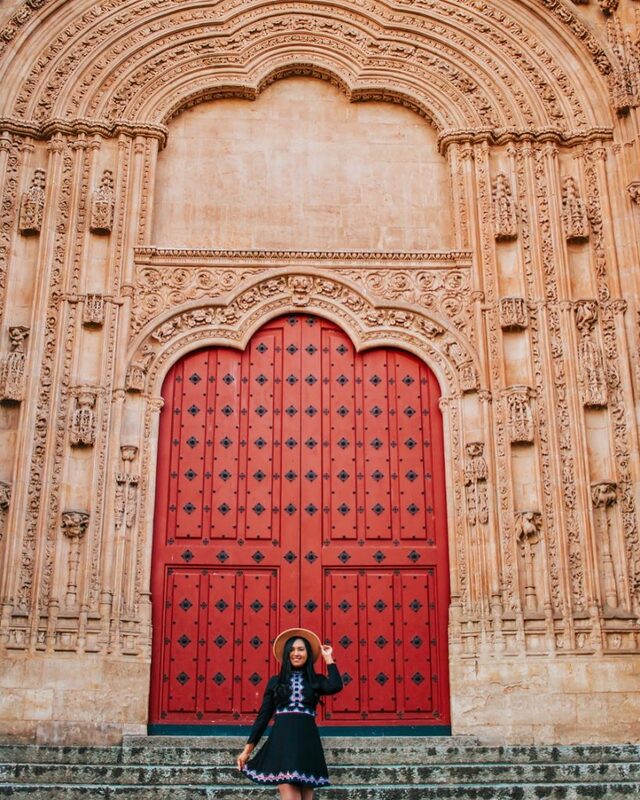 Perhaps the best examples of this (and the best location for capturing them for Instagram) is the doors of the Salamanca Cathedral. There is both a single door as well as.an elegant pair, and both are absolutely beautiful, flanked by stunning baroque architecture. The dash of dramatic red adds an eye-catching accent, making the doors the perfect backdrop for a show-stopping and beautiful Instagram post. Salamanca has many beautiful streets that feel and look like they’ve been frozen in time and plucked from the pages of history books. However, even amongst the many beautiful calles, Calle Libreros Street is a stand out. At the end of this long, narrow laneway, the impressive Faculty of Philosophy towers, while in its shadows are Cast Museo Unamuno, one of Salamanca’s best museums, and a spattering of stunningly charming antique bookstores and a chocolateria. 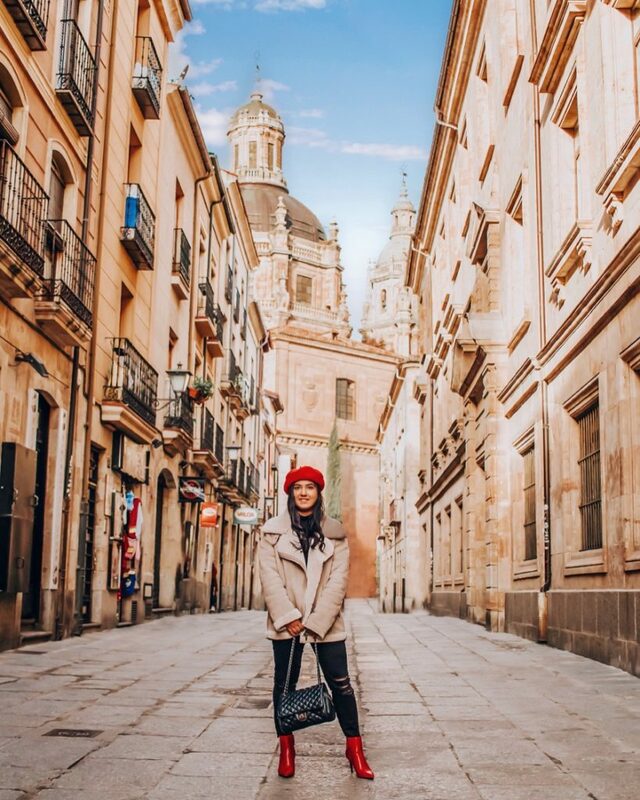 Not only is it one of Salamanca’s most beautiful streets, but it is also one of the best Instagram locations in the city. Dripping in charisma, it’s a stunning backdrop for a beautiful shot that captures the essence and immense charm of Salamanca and its scholarly architecture. One of the true masterpieces of Salamanca is the beautiful Convento de San Esteban. Construction on the stunning convent began in 1524, and once finished, it would be considered one of the most beautiful examples of the Spanish “Plateresque” style. This style blends Gothic, Islamic and Renaissance elements to create a dazzling and intricate result. These features are absolutely stunning when captured on camera, making them ideal for Instagram. 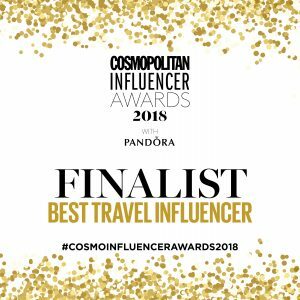 Both the inside and the outside of the convent are magical and ideal for beautiful snaps, but definitely be sure to visit the Cloisters of the King and the Solo Staircase. In truth, however, wherever you go you are sure to get some stunning posts. If you are looking to capture some magical and enchanting photos for your Instagram, then you will certainly not be disappointed by beautiful Salamanca. As you can see from these five stunning locations, the city is filled with photogenic and charming locations that are just ideal for wanderlust-inspired posts. It is hard to take a bad photograph in Salamanca, so I’m sure you will leave with a camera roll full of stunning images and memories. Disclaimer: This post has been created as a part of sponsored collaboration with Spain Tourism Board, but all opinions are 100% mine.